It’s been a while since Celts used to celebrate the end of a summer with a harvest festival. It was called Samhain. The ritual was linked to festivals in other Celtic cultures, and continued to be celebrated in medieval times. Because of its date (October 31) the festival was linked to All Saint’s Day (November 1) which is also referred to as All Hallows. The eve of All Hallows was called All-Hallows-Even which later transformed into Halloween. During Samhain people walked between Bonfires which was considered as a cleansing ritual. Young men wore costumes and masks, and they were impersonating dead. Celts thought that by all these they were warding of harmful spirits. Modern Halloween developed over time, but the idea stayed the same – people wear spooky masks and costumes to scare off evil spirits. At certain point humans began to commemorate souls by curving pumpkins into a so called jack-o’-lanterns. 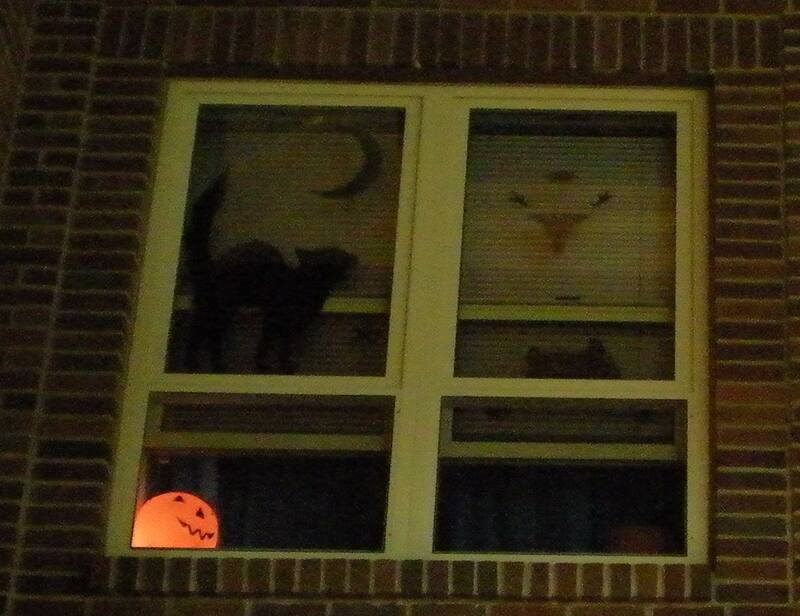 Pumpkins with a candle inside were placed in windows in order to ward off bad spirits. 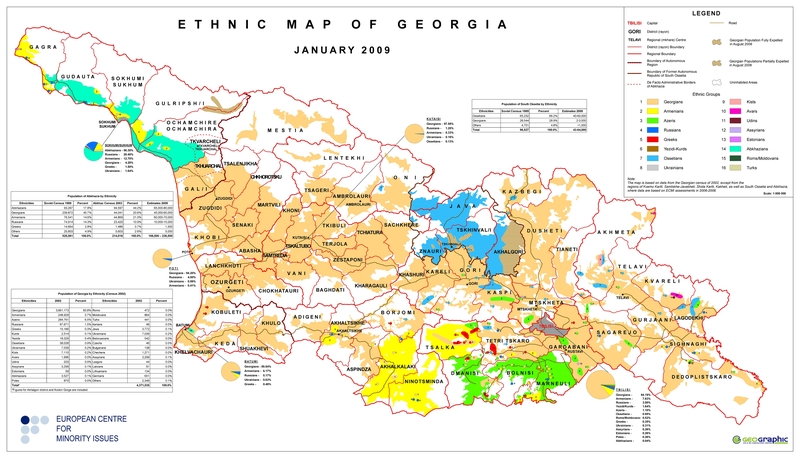 This is an ethnic map of Georgia that was released by the European Centre For Minority Issues. It is a bit outdated because it was released in January, 2009, but no other similar map has been released since then. According to the data there were 239,872 Georgians in Abkhazia in 1989, however according to 2009 data there are approximately 45,000-65,000 left, who either stayed after the war or returned mainly around Gali (which is the closest town to the Georgian border). 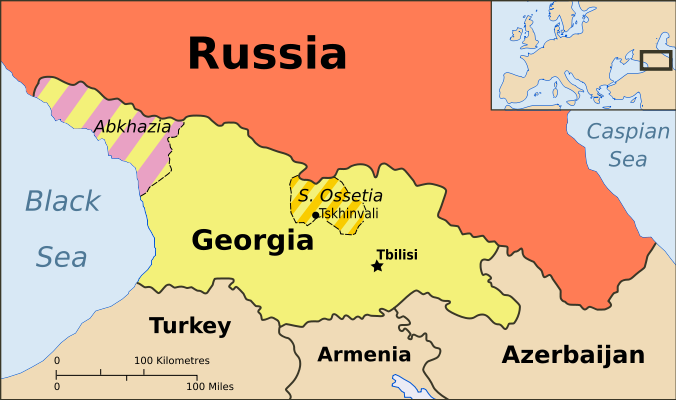 According to the same data there were 28,544 officially registered Georgians in South Ossetia in 1989, today the there are only 2-3,000. Most of the young Georgians from Abkhazia have IDP status and they live around Georgia or around the world. Those from Abkhazia have not had a chance to get back to their homes for almost 20 years, some of them even don’t remember how their houses look/looked (because part of the property was either burned or destroyed). Will they ever have a chance to stand on their homeland? Nobody has an answer..
All my short life, I remember conversations and discussions about the conflict in Abkhazia. I don’t remember the war, but I do remember the endless talk about its causes and consequences. I also remember the pain in the eyes of the thousands who had to leave their land. Some were happy just to have survived, but others left behind the remains of their beloved, never knowing if they would be able to go back and bury them. She never blamed Abkhazians for the war: many of them were her friends and neighbors. She just could not understand why Georgians, whose roots had been in Abkhazia for so many years, had to leave. In early 1992, the president of Georgia was thrown out of office and the Abkhazian Supreme Soviet Chairman took advantage of the chaos in Tbilisi to support the republic’s de facto independence. By July the constitution was replaced with one from 1925 which declared Abkhazia a sovereign republic. My father insisted we move out as quickly as possible because Gagra was no longer safe. But Grandma refused to leave with us, believing the war was just some kind of misunderstanding, and that she would be waiting at home until we came back. Finally, we ended up back in Tbilisi. The war began on August 27, 1992. Georgian laws were nullified, and Abkhazians began taking official posts in the capital Sokhumi. By October the streets of Gagra were full of Soviet tanks, and the town on fire. Georgian military forces entered but gave up within a year, since Abkhazian separatists were supported by the pro-Russian Confederation of Mountain Peoples of the Caucasus (CMPC) and Russian military units. Meanwhile, my grandma’s neighbors, ethnic Abkhazians, kept her safe for four years and in 1996 helped her escape to join us. Before the war, Georgians made up at least a half of Abkhazia’s population. Statistics aren’t clear, but between 10,000 and 30,000 ethnic Georgians died during the war, as opposed to 3,000 ethnic Abkhaz. Both sides were accused of human rights violations and some human rights groups support the claim that there was an ‘”ethnic cleansing” of Georgians. Today, the result for me is being among 250,000 Georgians forced into exile, an Internally Displaced Person. Will I ever see my home again? Abkhazia remains a self-proclaimed autonomous republic recognized by no country or international organization. The part of the ancient kingdom of Kolchis, that of Jason’s Golden Fleece, is currently a no-man’s land and is frequently referred to as a ‘Ghost Country’. However, a great number of Abkhazians already carry Russian passports, and therefore, if Georgia makes any aggressive moves, Russia will defend its citizens. For now Russia keeps quiet, not recognizing Abkhazia’s independence openly due to post-Kosovo tension in Chechnya and other regions within the Russian Federation. For ordinary people, the best solution can only be a restoration of trust. One side wants official status, another to gain back its territory, but already 15 years have passed and there is no movement – the conflict is frozen.